Some cats just want to choose their own names. So my friends Emily and Brett have a pretend pet cat. Pretend pet cat, you ask? Well, it’s just that he comes around and is super friendly. His real name is Dakota, but they’ve given him a new name…and he has accepted it. 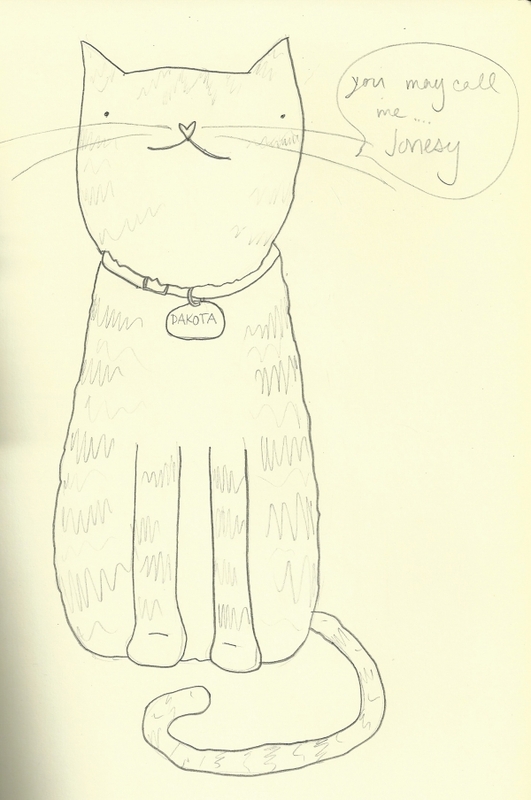 I honestly don’t know how the name change started, but I’d like to think that he sent some sort of cat telepathy to them and convinced him that Jonesy is his real name. But really….think about it. You have a pet. Your pet likes to wander and is rather friendly. All the sudden you see your neighbor calling to you cat with a new name. Kinda weird, right? I guess you can’t control what a cat wants to be called. Life lesson right here, people. Adam: “Did you trace that or freehand it…because I’ve never seen you draw anything that well before.” Um….thanks? Do you happen to watch Doctor Who? Cause this picture reminds me of Stormaggedon. I figure that, so long as they are paying you attention, it doesn’t really matter the name people use. I have managed to pick up quite a few, so I’ll consider that as “life lesson” learnt.